Prabhupad gives us that nice painting in Bhagvad Gita where mayadevi is puppeteer and we are puppets. And through the strings of the three modes of material nature, she is just making us dance in so many ways. And yet, we are so foolish, we are thinking, ‘I am dancing according to my wish.’ But actually we are being controlled. We are thinking we are the controllers! The mode of goodness string is pulled: “I am the beneficiary; I am giving charity; I am helping others in making them happy.”This way we think we are the doer. But actually we are the puppets in the strings of maya. Srila Prabhupad, he prayed to be a puppet. 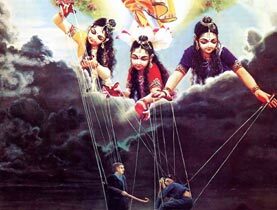 In Jaladuta he prayed, “Let me be a puppet Krishna, and dance and dance as you make me dance.” What we must understand is, we are always puppets. We are always puppets of Krishna. He is the ultimate controller of all the controllers: tumhisarveshwara. Do we want to be controlled by Krishna as a loving servant, or do we want to be controlled by material nature through the three modes? But (either way) we are always under control. A devotee who surrenders to Krishna, “You are the controller; I am yours.” That devotee actually becomes completely fearless, and could be peaceful and blissful in any situation, even in the most frustrating difficulties. The demigods they were looking down. They were aghast, because even though they are demigods, they drink nectar – heavenly nectar which is supposed to give you some sort of immortality – they were constantly in fear of Aghasura, because he was such a dangerous devouring demon. So here are these demigods like Indra, who have thunderbolts, powerful bodies, long lives, tremendous intelligence, weapons and armies; they are fearing Agha. Here are the little cowherd boys. What are their weapons? They have there flutes, buffalo horns and little sticks for herding the cows. But yet, they all just looked at Krishna, smiled and laughed, and danced right in to the mouth of Aghasura. And they were saying, “Let us go in. Krishna will save us.” Haribol! Now, that’s fearlessness. You cannot become fearless by any amount of high tech security devices in your home or your car. We see wealthy people; they have gates and guards and all kinds of cameras to protect them, but still they are in fear. And even if your body becomes powerful, and you are great with weapons, still you fear. The little Gopas, they were fearless – something that the demigod’s could not fathom – simply because they completely depended on Krishna. They had complete faith in Krishna. They took shelter of Krishna. Therefore, they just looked at Krishna, and just laughing they ran right in to the mouth of Aghasura. That is fearlessness. “Sukhdev Goswami told MaharajParikshit that the way to become free of fear is to hear about, chant and remember Krishna, the Supreme personality of Godhead. There is no other way to be fearless. Therefore, there is no other way to find peace, real happiness.” – Radhanath Swami. It’s an example of how when one receives the mercy of a great soul, how one’s life can be transformed, and one can become fearless. I happened to be meeting with some very, very dear friends of George Harrison. Prabhupad called him Sriman George Harrison ‘Hari’s son’. He was an object of Prabhupad’s mercy. Prabhupad loved him very much. In fact during Prabhupad’s last lila in Vrindavan, he took off one of his rings and gave to Tamal Krishna Goswami Maharaj and said, “Give this to George.” Prabhupad was remembering him because of his wonderful service attitude. The people I was talking to, they knew him (George) very well and knew his family very well. They were saying to me something that astounded them. They had never seen anything like this in their entire lives. These people are in their fifty’s. He wrote a song in the 70’s,‘The art of dying’ – that nothing is better than the art of dying. He actually believed that. He was living in a beautiful mansion; he had wife; he had a child; but at the time of death he just understood that Krishna is the Supreme controller. That can only come – such a consciousness can only come – by causeless mercy. 19 Responses to "The secrets of fearlessness"
I remember the time when George Harrison left this world. His family members and everyone around him were able to distinctly perceive his fearlessness. Thanks Radhanath Swami for beautiful description of George. Beautiful. I can now appreciate more whatever Radhanath Swami said about kitten in the mouth of a cat. Yes, fearlessness comes when we take shelter of the Lord and understand that we are not the controllers or enjoyers. This knowledge gives us the freedom of fear of death like George Harrison had! We can learn so much from lives of great devotees and we should try to inculcate such traits within us. 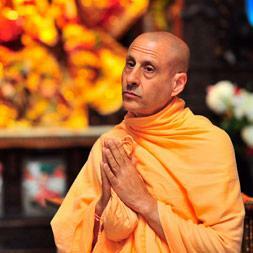 Thanks Radhanath Swami for beautifully narrating about George Harrison. I have so much of admiration in my heart for George. He gave himself to what he actually believed in. Surrendering to Krishna means following his instructions. ONe of the most important instructions is to remember him and serve him by chanting his holy names. we can say, George Harrison was a mass preacher, we can see that he could spread the Mahamantra across the universe by causeless mercy. Guru Krishna Prasad Paye ………..
George Harrison is perfect example of fearlessness.He teaches us the art of dying. Yes, we can achieve fearlessness only when surrender unto Krsna and have the faith that we will be protected by him in all circumstances. George Harrison’s emotional story is a testimony this. True. Thanks to Radhanath Swami for telling us Krishna’s protection through George Harrison. Truly. George Harrison is a wonderful and fearless devotee of Krishna. We can not achieve this fearless life without the causeless mercy of Krishna. Radhanath Swami rightly explains the reasons for our fearfulness and ways to overcome it. Wow, wonderful words of encouragement…….. 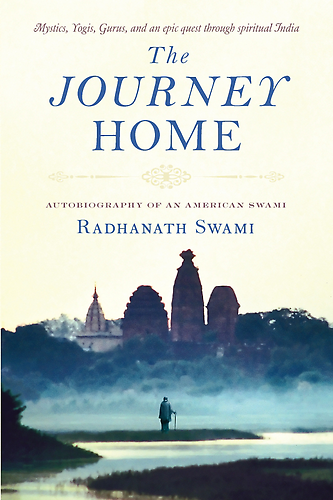 Such a wonderful article by HH Radhanath Swami. We should constantly pray for the causeless mercy. After reading this article – about how fearless was George Harrison was- i remember another talk by His Holiness, where he refers to the example of Kitten in a Cats mouth, it feels so safe and comfortable in his mothers shelter but when the same cat gets a mouse then the same mouth becomes Death personified. Similar is the Situation of devotees of the Lord, they feel sheltered when death comes because its their entry door to Lords abode, and this is the most beautiful thing. One is in the mouth. Looks like one more is in the belly ha ha.